Fox's Den is your home away from home in Gatlinburg. It's a beautiful cabin where you will feel right at home. You’ll love the cabin's location nestled in the woods on a quiet dead-end street perfect for families, or couples looking for a private retreat. New appliances in 2018, and new carpet and living room furniture in 2019! 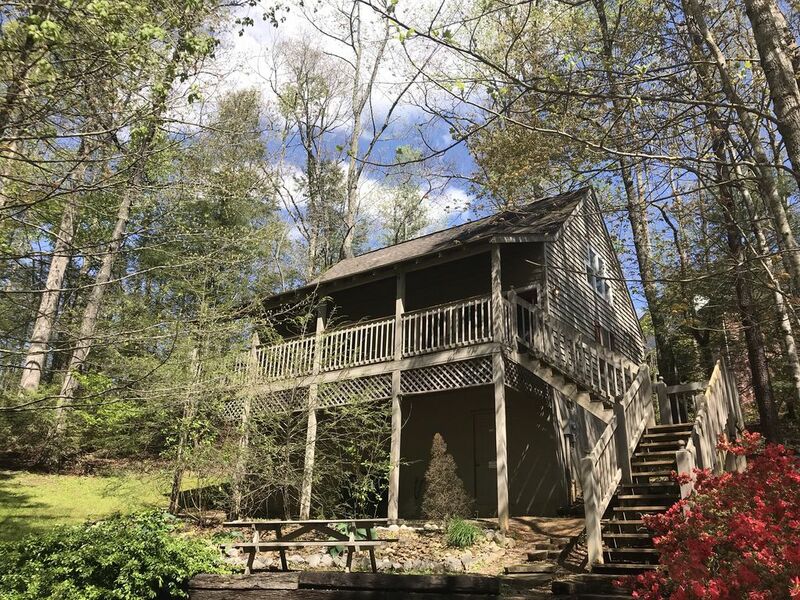 We, the Bernards, recently purchased Fox's Den because our daughter now lives in Gatlinburg, and we wanted a place near her family that we could rent out as well. We are retired and live in southwest Virginia. Our daughter, Cyndi, will be handling most of the communication. She is happy to answer any questions you have, and would love to recommend her family's favorite restaurants, things to do and hiking trails! Location! This home is in the middle of the Arts and Crafts Community, but convenient to Gatlinburg. The cabin is very comfortable and feels more like a home than a rental cabin. Again, the location attracted us to Fox's Den. We love sitting on the covered deck enjoying the mountain air, or walking around the neighborhood and strolling down to the nearby craft shops and cafes. Fox's Den is nestled in the foothills of the Great Smoky Mountains National Park. Keurig coffee maker as well as a standard coffee maker, filters and a coffee grinder. Dishes, glasses, bowls, measuring cups and spoons. Excellent cabin in the smokies! The cabin was wonderful! It was perfect for 3 adults and a child. Close to everything! It was quiet and peaceful too!! We enjoyed our stay in this cabin very much. It was clean, well maintained and nicely appointed. We would definitely return. Great cabin not far from downtown Gatlinburg. It’s close enough to run back to the cabin to rest between activities. The cabin was very clean and the area was quiet. The owners were quick to respond. We had a great time while staying there and the next time we visit Gatlinburg would definitely stay at Fox’s Den again! The cabin was very clean and quiet. My wife really liked the kitchen and all the furnishing's. The granddaughter's loved the hot tub after a day of shopping and hiking.GREAT place to call home for a vacation. This was the perfect place for our family to stay. You can walk down the road to the arts and craft area to shop and eat. And it is also a quick and easy drive to the heart of Gatlinburg and the Smokey Mountains. We loved it! We loved it!!! The cabin was so clean ! It felt like home . It was very private I think I saw the neighbors maybe one time. I highly recommend it! We enjoyed our stay so much and it was a great price.